Part One of this series on the history of timber framing saw us review thousands of years of history across multiple continents. Today’s article introduces you to the history behind timber framing’s rich traditions. 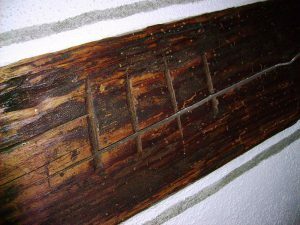 Still carried out today, timber frame traditions range from ceremonies to saw marks. One thing these traditions have in common? Each appears to have originated as a regional distinction, later spreading across countries and continents. Need to read Part I? Click here. In addition to areas developing their own timber frame building styles, some regions’ craftsmen started unique traditions. Perhaps you have heard of (or witnessed) a topping out ceremony. Topping out ceremonies are not signaling the beginning or end of construction. Rather, the tradition involves placing a tree or bough at the highest point of a structure. The underlying reason for (and origin of) this ceremony is still debated today. One author posits that the topping out tradition has its origins in 8th century Scandinavia (Vanhoenacker, 2013) while a different theory is that topping out dates back to ancient Egypt (with a plant being used as opposed to a tree). And, while one article claims the tradition began as a way in which to placate the tree spirits (Columbia University School of Social Work from The Ironworker, published by the International Association of Bridge, Structural, and Ornamental Ironworkers, Washington, DC., 2003) who had been inconvenienced during building, other articles state that topping out is a rite brought to construction by Native American builders who believed that no man-made structure should be taller than a tree. Thus, while the tradition itself leaves many questions, there is no doubt the ceremony spans much of the construction around the globe. Riverbend Timber Framing has had more than one topping out ceremony during its 40 year history right here in North America. Another regional distinction was what is referred to as carpenter’s marks (Timber Framing, n.d.), aptly named as carpenters would (and still do) leave marks on individual timbers. Sometimes carpenter’s marks were chiseled. Other times they were saw cut. And, while some of these marks were practical in nature, numbering individual timbers for assembly, for example, many carpenter’s marks were unique and did not necessarily serve any (known) practical purpose. Below is an example of a Bavarian carpenter’s mark. Here at Riverbend, our timber artisans don’t use cut-in, permanent, carpenter’s marks. On more than one occasion, however, a customer has asked a craftsman to sign a truss or even hand carve a date or quote into a timber. 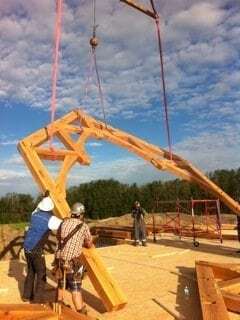 The timber frame tradition of “raising” is the one with which you are probably most familiar. Dating back to the days of manual labor, a timber frame raising was an event where the entire community came together to erect a neighbor’s timber frame barn. This is because before the days of cranes and forklifts, the only manner in which to raise a timber frame was literally with man and horse power. These occasions were known for hard work and plentiful food, and entire families would participate in one manner or another. In some parts of the world, this hands-on method is still practiced today. For example, some Amish and Old Order Mennonite communities continue raisings, while eschewing modern equipment. 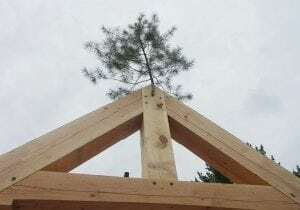 Non-profit organization, Tillers International, offers a five day class in the U.S. called, “Timber Framing & Raising” as part of its curriculum. This class, along with its many others, is part of Tiller’s global mission to improving the lives of people in rural areas by exchanging skills that empower communities. As some rural communities lack power, it only makes sense that timber framing and its raising is considered a valuable skill. While we don’t offer classes at Riverbend, we do invite those of you interested in a timber frame home to join our timber raising events. Depending on a home’s location, including remoteness and road access, our timber frame raisings can have a festive atmosphere just as ones from the past. If you are interested in experiencing this delightful tradition, check here to locate a raising near you. [i] Because your safety is our top priority, we do require RSVPs for each raising event. You can also see videos and photographs of raising events on our Facebook page. Please visit our Timber Framing Blog in two weeks to read part three of the series. 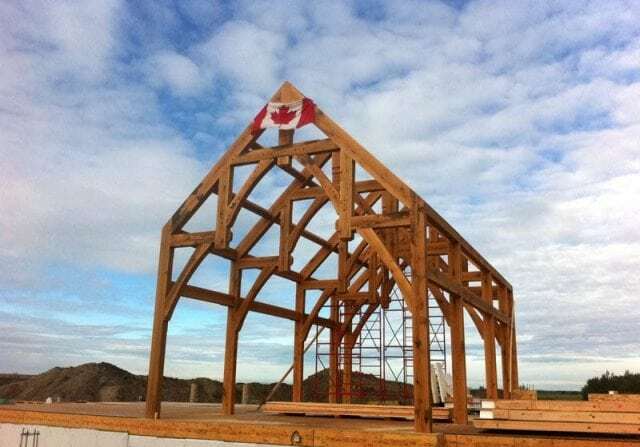 We’ll be writing about the “re-discovery” of timber framing in North America. [i] Raising events do not take place during the winter months in many parts of North America.